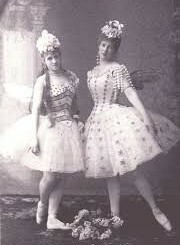 Marie Petipa was the daughter of famous choreographer Marius Petipa, but she has quite a tragic story behind her. Marie Mariusovna Petipa was born on the 29th of October 1857 in St. Petersburg. She studied classical ballet under her father Marius Petipa. Her mother was Maria Petipa. 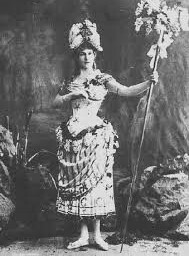 She made her debut at the Mariinsky Theater in 1875 in a ballet called Le Dahlia Bleu and her dancing career, mainly in the character dance repertoire lasted until 1907, but she did perform on rare occasions through until 1911. At the height of her career, Marie Petipa was one of the most known ballerinas in St. Petersburg and many portraits were drawn by well-known artists at the time. In fact, a portrait of her by Konstantin Makovsky has survived to this day. Her private life was discussed in the newspapers and her 25th career anniversary in 1901 was widely celebrated in St. Petersburg. Vias Doroshevich wrote an article about this occasion entitled Goddess of Joy and Merriment. Marie Petipa went on many tours abroad and was awarded Ordre Des Palmes Academiques in France. She was in a civil marriage with the dancer Sergei Legat who was much younger than she was. She left theater two years after her husband committed suicide. It is widely believed that Petipa lead Legat to commit suicide and then she married a businessman in 1910, getting ten million francs as a result. When the revolution happened in 1917, Marie Petipa was sixty years old. The revolutions took everything from her including her house, pension and she even had no money for food. Even though she pleaded for help from the Government, she received none. Eventually, the Directorate of the Academic theaters petitioned to grant Petipa a pension in 1924. In 1926, she moved to Paris where she lived in appalling conditions. She had two strokes and she died of impulsive insanity on the 16th of January 1930. She was buried near Paris, but the money paid for the funeral was only enough for five years, after which she was reburied in a common grave. This is a very interesting topic, So much has been said in this post And I really appreciate the fact that you shared this history with your blog readers. I haven’t heard about Marie Petipa before now but your article has opened my eyes to what I don’t know about her and I must tell you I learned a lot. It is always fun to read the life stories of others and what they achieved. I also enjoy reading about our predecessors and what they got up to in their lives, especially if they have influenced the present in any way. What a fascinating article about Marie Petipa, someone of whom I had never previously heard. She certainly did have an eventful life, perhaps too eventful! But as you say, it is also a tragic life. I was wondering, was she dancing at the same time as Anna Pavlova? Very many thanks for a really interesting post. I think she was a little before Anna Pavlova, but they both worked for the same company. The post spoke elaborately about the life and times of Maria Petipa. The history of this great ballerina tells tales of how disastrous war and its effects can be. Having lived and influenced Soviet culture as much as she did. Her name is etched in the sands of time though her body may lie in a common grave but she’s forever remembered. Wow! Amazing story! It is sad that those type of dancers die with their work in vain, not gaining credit for paving the way for other ballerina dancers and have to be treated so badly in the old age. Their should be an award or a type of contribution for those persons. Great article! Thank you for sharing! I agree. It is really sad that a lot of these great artists die as paupers.